Before I even say anything, just look at the colours and the vibrancy of this dish! How anyone can say that healthy food is boring, or that eating a low-fat diet is a life sentence never ceases to amaze me! Since I have been on my weight loss journey, I think that I am more inspired than ever to make the food I prepare really exciting, colourful and tasty. 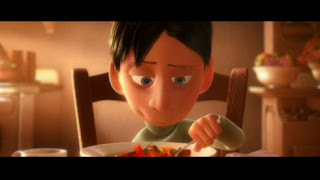 I hope that if you make some of my recipes, that you will start to feel the same. The inspiration for these ratatouille stacks originally came from my love of the kids' film, 'Ratatouille' (Pixar Animation®/Disney®). 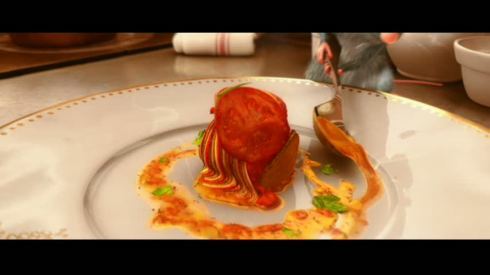 The piece-de-resistance dish in the film (cooked and served by a cartoon chef rat! )is a rather amazing layered version of this well-known dish. 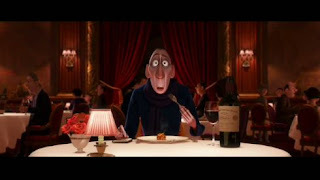 When the harsh restaurant critic, Anton Ego, sits down to try the ratatouille, he is transported on a nostalgic journey through his childhood with each mouthful he takes...the food evoking wonderful, emotional memories for him. This scene sums up, for me, exactly what good food is really about. I think that anyone with a love (or obsession) for food is looking for these warm associations of love and comfort, flavour and satisfaction and maybe a little nostalgia-that feeling of "coming home", thrown in. I believe it is one of the triggers for comfort eating, as we are constantly seeking that 'fix'. (The true meaning of nostalgia is...'a sentimental longing or wistful affection for the past, typically for a period or place with happy personal associations'). So, if we can try and evoke those feelings with delicious, nutritious, filling food we've cracked it-right? This dish makes a wonderful accompaniment to main courses such as chicken kebabs, salmon etc. It is 0 propoints (around 50 kcal per stack). It is very easy to prepare. Start by slicing the aubergine and courgette into chunky, but thin slices (about 1/2 cm thick). This is important as you want the vegetables to cook thoroughly, but not go floppy so that they will stack and hold their shape beautifully. Spray a griddle pan with Frylight sunflower oil and griddle the aubergine, courgette and tomatoes until well-browned on both sides. While the veggies are cooking, make the tomato sauce. You can make this sauce two ways. If you are time short, just combine some thick passata with a little tomato puree, artificial sweetener and black pepper to taste, then heat gently. If you have a little more time, the version using fresh tomatoes is sublime. Pop the fresh tomatoes in a large mug or tall container with a sprig of fresh basil. Using a hand-held blender, blitz the tomatoes until liquid. At this stage, it is quite an unfamiliar pale peachy red. Place the mixture into a small saucepan. Add the tomato puree, artificial sweetener, and black pepper to taste. Bring to the boil and cook for a few minutes. Sieve to remove the lumps and skin of the tomatoes. You are left with the most incredibly vibrant, smooth red sauce, which tastes amazing. To serve, spoon a generous tablespoon of the tomato sauce onto the serving dish. Swirl it slightly. Layer the griddled vegetables; aubergine followed by courgette, then baby tomato. Pierce the tomato and squash it slightly so that you can add the next layer of vegetables. Make one stack per person using 3 slices of aubergine, 3 slices of courgette and 3 tomatoes. Add a tiny sprig of basil to finish. Try to make the stack secure, but not too perfect. It has a certain charm about it if it's slightly wonky. Little stacks of happy memories. This is like reading a chapter from a book and then, the best thing is that when you've finished reading, you can make that wonderful, colourful recipe to delight the taste buds of your family. Great photos yet again. You're getting so clever Janey!